If you own a Kenwood TS-2000 transceiver, you probably already discovered that it contains powerful DSPs (digital signal processors). They are used at several points in the signal path, and also the audio from the microphone and to the loudspeaker gets processed by a DSP. The radio allows activating a user defined profile for the audio (“USER” in menu #20 for RX and menu #21 for TX), unfortunately Kenwood decided not to provide any kind of equalizer software, perhaps to push the TS-590 a bit. 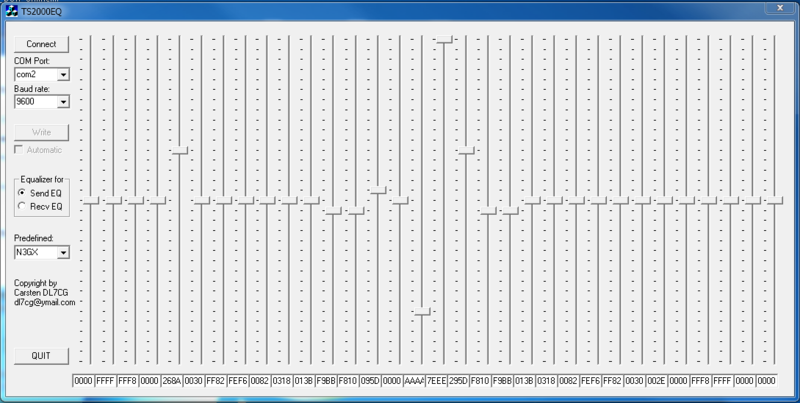 Alex N3GX wrote a software called “DSP Modifier” a few years ago, and included four very nice profiles. They give a much better sound, compared to the built-in settings of the TS-2000. Unfortunately it is absolutely unclear how Alex created the profiles. Furthermore his software requires to enter signed hexadecimal numbers, which is not user friendly at all. So I decided to write a similar software and use sliders instead. After finishing the programming I discovered that there is no simple relationship between the numbers and the audio spectrum. At least I recognized that we have 32 WORDs instead of 16 DWORDs. So the current version got 32 sliders. The usage of my software, called “TS2000EQ”, is more or less self explaining. Select the com port and the baud rate (see menu #56 in the TS-2000) and click on “Connect”. Then select “Send EQ” or “Recv EQ”, depending on what equalizer you want to modify (TX or RX). And load a predefined setting as a starting point. If you select the check-box “Automatic”, every slider movement will be directly written into the TS-2000, and you immediately hear the result. The software stores the last settings in the Windows Registry. Please let me know if you understand how the sliders representing the 32 values influence the audio spectrum. I’m a new owner of the TS-2000, and i’m far from familiar yet, so i’ll wait a little using it. excellent job its very nice the way you can change your audio so easy, i wonder its any chance to save the audio you make with eq on a file so have it as backup if you make reset on your radio for example. Well, the tool stores the current settings in the Windows Registry, and reloads them the next time the tool is started. Another idea is to have a kind of import/export function so that the profiles can be easily shared with other OMs. But the first thing should be to understand how the 32 values behind the sliders really influence the audio. If you play around with them, you will discover that it is not as easy as “the first values/sliders are for the highest and the last for the lowest frequencies”. There is a much more complex function behind them, and I hope someone figures out which one. That’s the only thing missing from the s/w. Thanks for the tool, Great job. be more helpful to have import and export fuction so we can have differnts audios to play. I am very happy to have a soft like this giving me access to EQ RX-TX. Import/Export module is a wish. Also a definition of each band EQ will be nice to have. You have made a very good job Carsten ! So far, I used N3GX software but yours is much more convenient, I look forward to future improvements. Being an owner of a TS-2000 from the beginning this looks very intriguing. Does this open the transmit filters as well? I have also become a SDR user when the Flex5000 first came out. Owning a Flex 5000 and an Anan-100, so I haven’t found anything that compares to SDR Radios these days. But I hate to see my TS-2000 sit in the back like it does, so maybe this is a good way to play with it again? The problem with the TS-2000, it is a deaf radio. I have seen some modes that’s suppose to improve on the RX? Thank you for this program. Perhaps if and when I get to play with it, I will come back and let you know my results! Again Thank You. Unfortunately the TS-2000 only allows writing, not reading. My software stores the current settings automatically in the Windows Registry, so if you do a factory reset of your TS-2000, you can simply rewrite the DSP setup. I have found this software to be very useful. I set the Recv EQ on Automatic and sat in on a rag chew adjusting as they talked. When the EQ is set for USER the audio from the 2000 to the speaker sounds great and has a boost of almost twice as no EQ setting. From there I wrote down the hexadecimal numbers for each slider. I input the same numbers into the Send EQ sliders. I run the stock mic and this helped a lot with the audio and drive for the 2000. I have two setting that I wrote down. The first one I was told was right at the ragged edge of too much EQ. I went back and softened the settings and now I am told it sounds just like a clean FM transmit on SSB. I can post the hexadecimal numbers here if others would like to try it. Has anyone figure out a good setting no luck so far. Thank You for the program just need to do more homework. I noticed that after connecting through mikrokeyer , no longer want to run .. after connecting directly works well. A beautiful tool, this software is very good, another option for those who have the best radios from Kenwood ones. I came back to post the EQ setting I found that worked best for me. Open your TS2000EQ app. At the bottom is the hexadecimal numbers for each slider. From left to right. In the first Text Box click to highlight and to switch to the next tap the Tab Key. Repeat as needed and enter the following hexadecimal numbers for each slider. Each Text Box needs four hexadecimal numbers. Good luck hope it helps. This is the best to my ear for Rec and was told same setting is great for TX. I found that if you turn on the processor it will not change(seems to even decrease) the audio. Keep in mind to watch the ALC and adjust the mic gain as needed once you have wrote the new EQ setting in for TX. I hope this helps others with a starting place or they can use the same setting. I would like to thank you for the time and effort you have put in to you TS2000EQ. What an absolutely fantastic peace of software this is! Now i can stop all the comments from other Hams about my MC60 mic being pitchy “Hurray”. It will make a nice addition to my shack. A save fuction would be nice to store my own settings for different working conditions if that were possible.